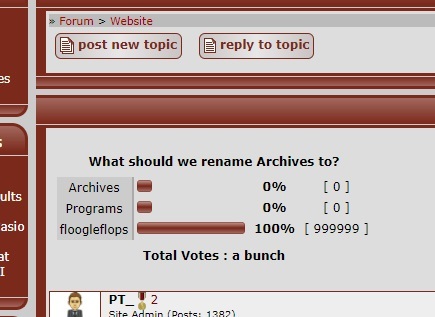 What should we rename Archives to? We have a quick question for you. As you might know, Alex is already busy with some navigation changes, and one part of it is maybe renaming Archives to something else, as it might not be clear for new members that you can grab programs from the "Archives". So please vote in the poll what you think is the best naming for it, and if you don't agree with any of them, feel free to post a new name. I vote to keep it as "Archives", just because it sounds smarter. If it comes down to it though, I wouldn't mind it being called Downloads. Among other things, please think about what would be the most recognizable to the largest swath of the general public coming here looking for GAME 4 CALC and so on. I tend to say stuff like this a lot, and I use stuff like this myself a lot, too. I came up with more options that weren't in the poll, but I think would be reasonable options, file downloads, or just files. I would say Programs because most people looking for games/other things would already know that it comes in the form of a program. 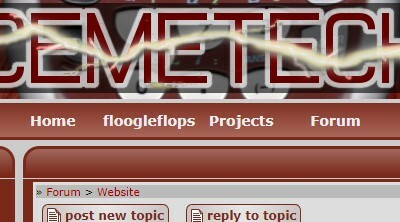 When I first stumbled upon Cemetech, it looked to me like a website with so many buttons and boxes of text, and it still does. I think every person that comes here for the first time is looking for games/programs, and seeing the word "Archives" didn't immediately make me think of that. The only reason I eventually found the games was by watching Kerm's "How to Put Games on Your TI84 Plus CE" video. Maybe this was just me, but I think it would benefit new users a lot if it was renamed to "Programs and Games", or something similar. I think it's better to keep it as-is, as it seems to attract the right kind of people for the most part, as testified by the wonderful communities that have come from it. Yes, I am 100% allocating the friendliness of our community to the fact that our file archives are called archives. That sends a pretty bad message. "Oh, you can't find programs to download on your calculator? Well, you aren't the right kind of person we want visiting our site." See? That's a terrible message to send to visitors. Downloads. Archives is unclear if you don't already know about it, and Programs is easily confused with Projects. I like archives, but that is likely because it sounds smarter and as a community, we are resistant to change ... ! For the general masses in which we hope to attract, Downloads is probably the more familiar choice. I agree with this - Archives sounds more professional, but if we're trying to be an open-armed, welcoming community, I think Downloads will be clearer to newcomers. FWIW, while ticalc.org uses "archives", all of Omnimaga, CodeWalrus and TI-Planet use "Downloads" in the main user-facing links and buttons (though for the latter, as mentioned above, some PHP pages' name contains "archive"). I think "program downloads" makes more sense then "program archives". Generally people will be searching for "downloads", not "Archives". Drewster30, a new member here, was confused about the current naming. He would prefer that it was called downloads, and that the labels actually in the archives were "more descriptive". Unfortunately, this is all I can wheedle out of him, as he his now playing Forza Motorsport 5. Here is a list of other notable calculator hobbyist communities archive names. Do with it what you will. When I hear "Archives," I think of older or historical material that has been put into a less accessible format for practical purposes (like storage space). "Archives" could possibly be interpreted as a place for old forum posts that are locked where no more replies/discussion is allowed. I think that "Downloads" is much more standard and easier to understand for newcomers. The community has spoken! It's official! On a more serious note. When I first came to Cemetech, I too was confused that Archives was where the programs were stored. It also took me a moment to figure out that pce meant Plus CE, though it only took me a second so I don't think it's much of an issue. Personally I think that Downloads would be the best name to replace Archives since that's what it is. Maybe try refreshing the page? © Copyright 2000-2019 Cemetech & Christopher Mitchell :: Page Execution Time: 0.179503 seconds.